Wow, would you take a look at that – 100 days!! Now that’s a holiday! Sorry, you have to allow us a little gloating, we’ve had a rough day or two. With this all set perhaps we could finally leave town for the weekend. Having heard about an eco-lodge just outside the town that was said to be a nice retreat in the jungle we had just enough time to get there before the light faded for the day. There was 10km of churned up dirt road before we saw the sign to ‘Dreamland Eco Lodge’ that pointed up a small path. We knew from the instructions online that it was another few km to the lodge, and the road to get this far had already had been slow to say the very least – we didn’t like the idea of getting stuck into some more serious off road with the light going, and also were not keen on leaving Ivor at the roadside to proceed on foot so decided to head back towards town, and give it another go tomorrow. But what was that aroma as we stopped to turn around in the street? Clutch plates? Seriously Ivor, you HAVE to be kidding! He was kidding, in a way. 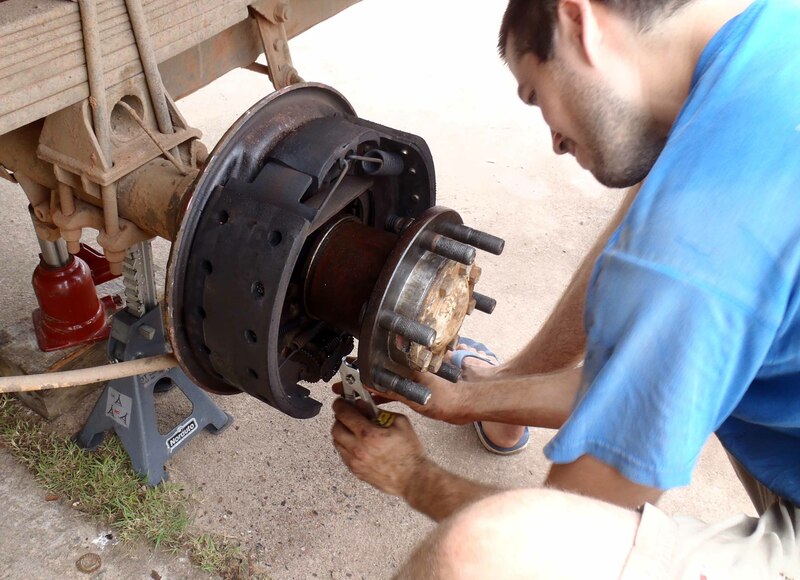 By the time we returned to the firmer ground of Vientiane it was very obvious where the odour was originating – the rear brakes – because they were on fire. Pulling up at a set of lights we caught a glimpse of smoke pouring from beneath the left hand wheel arch. 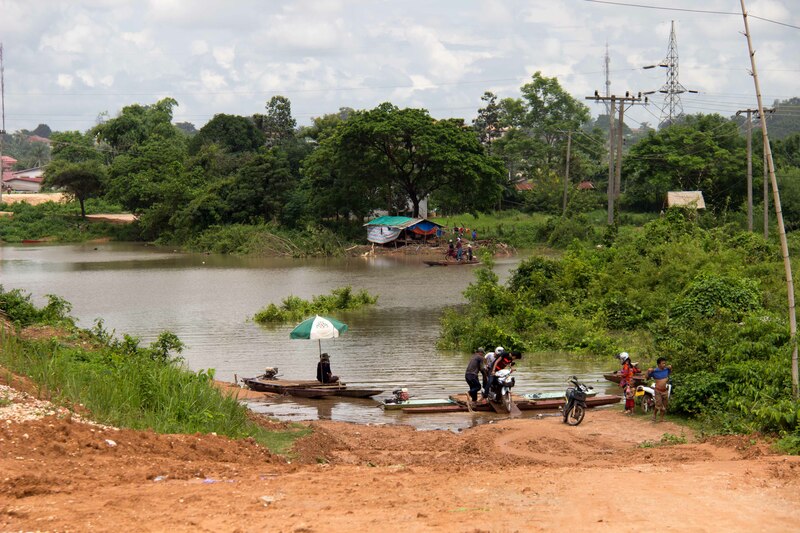 Very quickly we pulled off the road and stopped to see what was going on – and a Laotian family that were sat around leapt straight to the rescue with buckets of water, followed very quickly by a hose pipe. After a good and thorough dousing it was clear that the smoke was coming to an end, but that the truck would be staying put for a while. 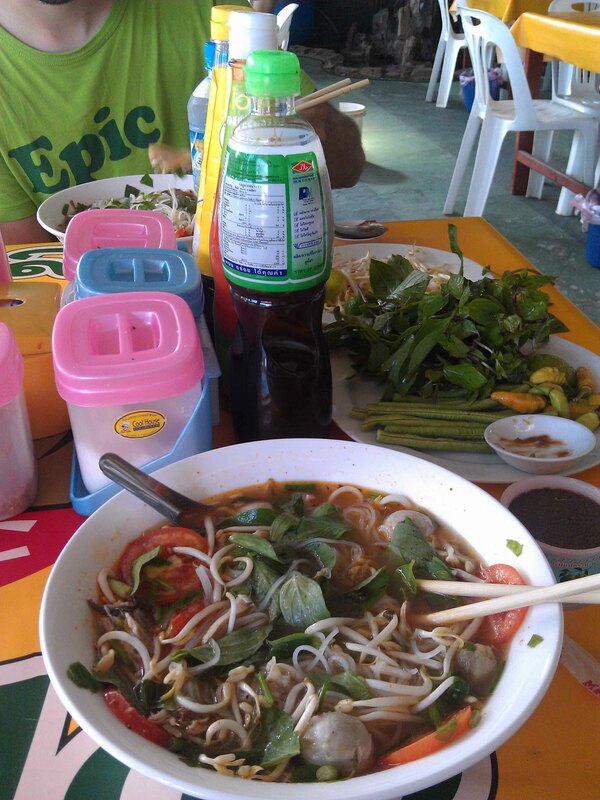 We bided our time at a small street restaurant, where the Vietnamese owner was clearly enjoying his Friday night. He cooked us up some special fried rice for 10 000 Laos Kip (1.2 USD) each, and went back to a table with his friends where they were building up a considerable collection of Beerlao empties. When we were done eating, they asked up to join them and charged our glasses before we even tried to resist – it was just what we needed! Getting back to Ivor to find the brake nearly seized, the wheel too hot to touch, and having been on the receiving end of a few generous refills we shuffled him slightly further out of the way and laid up for the night – surely things would look a little better in the morning? Wheel off, drum persuaded off (with 3 foot crow bar and club hammer), soot dusted down – and the verdict: Mikes mechanics, the #@#$$@# ‘s, had not adjusted the one set of shoes correctly – they had been rubbing against the inner face of the brake drum, the fluid had eventually heated and expanded applying the brake yet harder; leading to the tight spot in which we now found ourselves. All that soot? That shouldn’t be there. With readjusted brakes we gingerly rolled back to the workshop to find out if any further damage had been done. After a good inspection, everything seemed to be in order. The shoes were not permanently damaged, and the rubber seals of the hub and brake components too were still intact – somehow, even the tyre seemed to have escaped lasting damage. Free to leave town once more, we decided to go to another eco lodge, a little further off – but perhaps easier to reach with a 3 meter high camper van. On the way out of town a traffic policemen was kind enough to explain, in exchange for 50 000 kip, how the traffic light systems work in Laos – apparently the red one at the bottom means stop: This was news to Vaughan. Having originally offered to explain this rule for considerably more money, and muttering about the need to accompany him to the police station on Monday, we were quite pleased with the outcome in the end. Only one more quick stop off to pick up more fresh fruit, and we were on our way again. We put our faith in the little box of lies suckered to our windscreen (GPS), but for once this faith was well placed, despite the meandering dirt tracks that decreased in size, and lead ever deeper into the jungle – after 45 minutes on the rough stuff we came to the Ban Pako Eco Lodge gateway. We are still not exactly clear on what defines an ‘Eco’ lodge, other than that they try to carry out their business in an environmentally aware fashion. 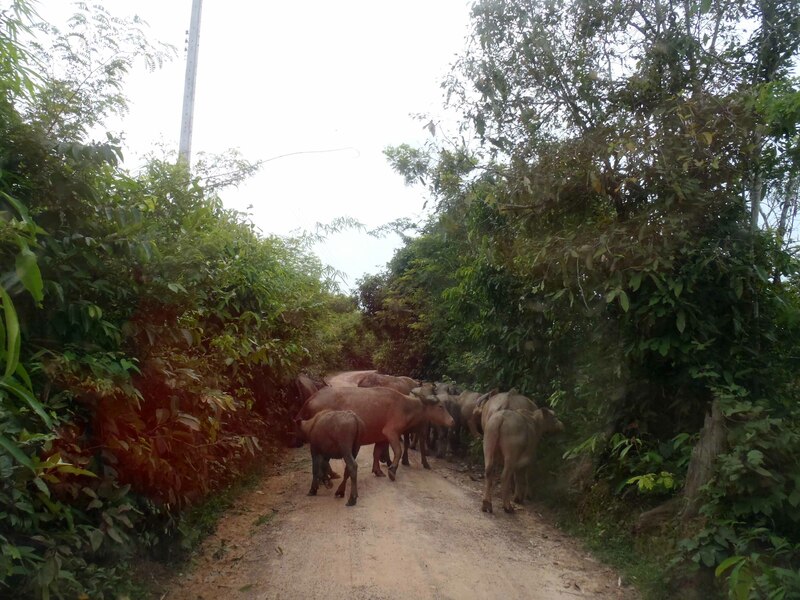 This particular one focuses its efforts towards preservation of the local jungle habitats – mostly through the development of skills of the local villagers, so that they have options outside of logging or the farming of sticky rice to bring in some money. 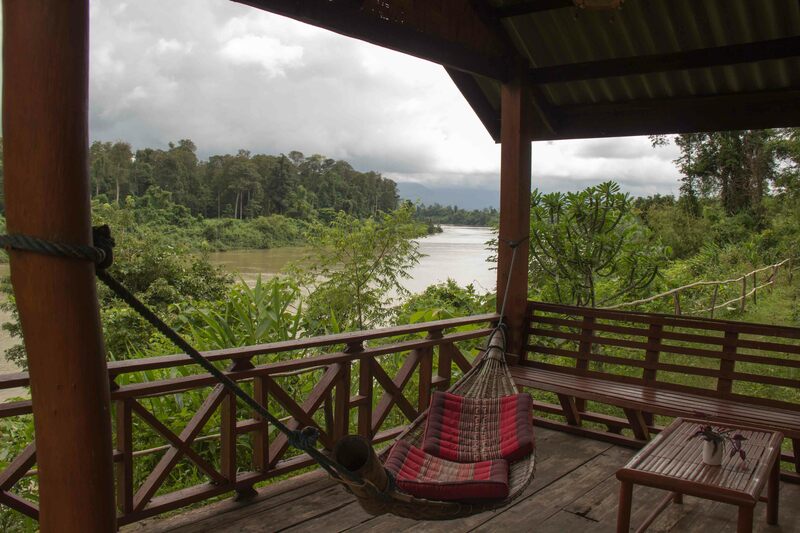 Our Ban Pako Bungalow – there are worse places to find yourself…. 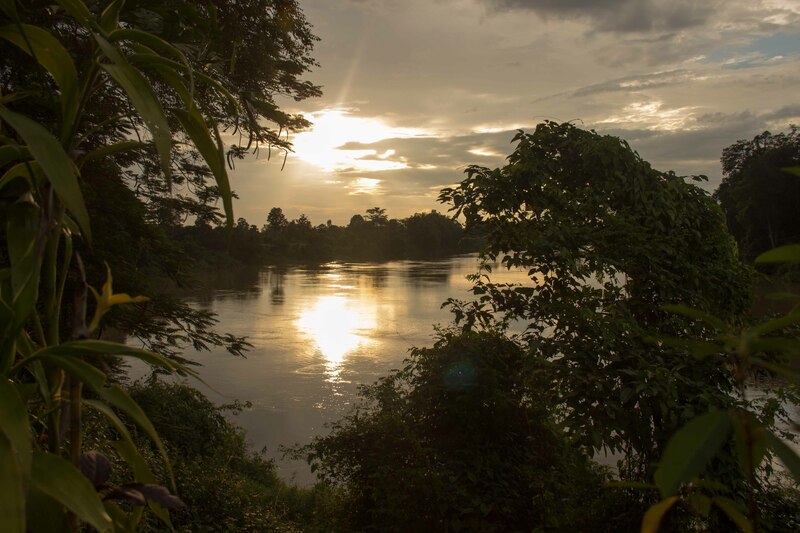 It was a beautiful site, with a collection of huts-come-bungalows set alongside the Nam Ngum river in a small jungle clearing. There was a small restaurant, and by the looks of it we would be the only guests for the night. After tucking into some great Laos food we went off to sleep in our little hut listening to the buzz of the jungle, punctuated by the whooping of what we think must have been monkeys. But even for birthday girls, there were still some jobs to be done… so we tidied out Ivor, sealed the edge of the flooring in the hutch (a job still left over from Toulouse! ), and adjusted the driver’s door that had been shaken out of alignment. Boring stuff aside, we were free to enjoy the area taking a walk off into the area of jungle that was owned by the eco lodge. Some hiking trails had been made for guests to follow, and we did our best to follow a map that we had for them. Once we were two thirds of the way around the loop, the path became steadily more overgrown, we had only a couple of feet to scramble through in places. 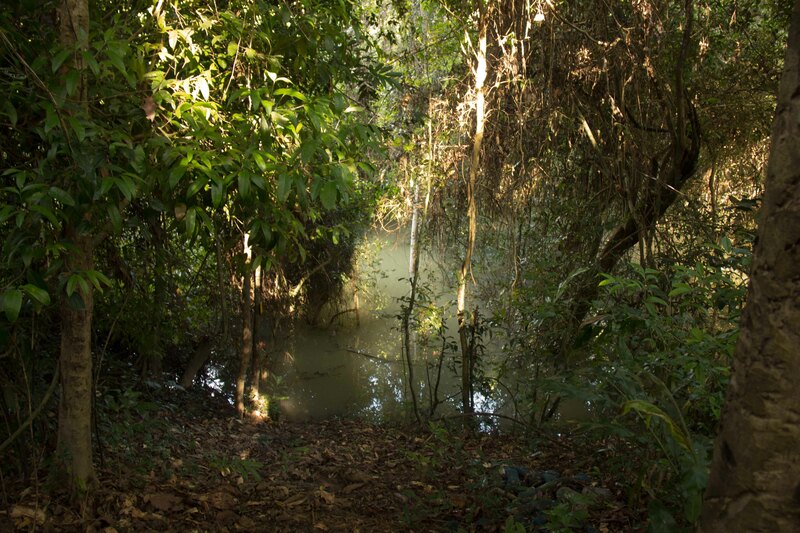 We pursued these trails for some time before, in the final few hundred meters before returning to the lodge, we were confronted with an obstacle that we could not clear – with this being rainy season, the river Nam Ngum was way higher than usual (in dry season, it is about 10 meters lower, we would learn later). The path ahead was most definitely submerged, and we had no choice but to retrace our tracks. We were spared some of the tightest sections that we had crawled through by a corner cut that we were lucky to find. 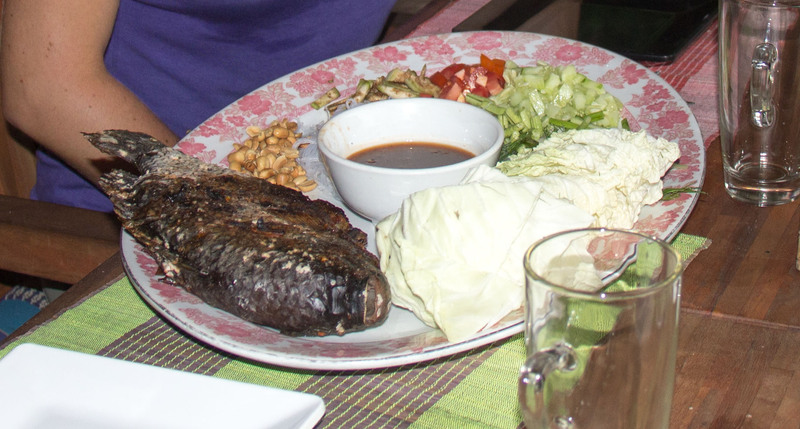 Back at the lodge, we had some birthday Beerlao, and had a dinner of grilled fish, and whiled away the evening on our huts front porch (complete with hammock). We dragged ourselves out of a peaceful slumber in time to get some coconut milk pancakes along with fresh banana and pineapple for breakfast, amazing. We faffed around tidying out the truck a little more, but the main job for the day was to get back to Vientiane so that we could pick up our lovely new Indian Visa, and to get ourselves in order to apply for the Myanmar one the following morning. We achieved this with ease, and went out for an Indian meal to celebrate at a place recommended by one of the embassy workers. Another ‘getting stuff done day’ – off to the Myanmar embassy for our next visa application, then to the Australian one where we had heard there was a doctor’s surgery (office) that would also provide services to holders of British Passports, and those of the Commonwealth. This meant that we could see what impact our planned changed of route through Myanmar and North East India would have on the medical supplies that we should carry with us – both in terms of the malaria zones that we would be going through, and in case we should have any emergency treatments with us, since the areas are relatively remote. The outcome was simple, we could stay on the same antimalarials, and we should carry a few extra medications, including some antihistamines in case of bites or stings from any jungle nasties – Myanmar or not, it sounded good to have these things on board! Erm, blog day! Putting this thing online takes time and effort you know! We’d not been allowed access to the blog host website throughout all of China (not being super-keen on freedom of speech), so we were getting pretty behind. According to the blog we were still in Uzbekistan or something, so it was time to start catching up, sitting in the hotel lobby straining their WiFi to the max. Another bloggy morning, before collecting our Myanmar visas and then taking a trip to the remarkable COPE centre. It is a charitable foundation whose founding principle was the development of affordable prosthetic limbs, and providing them to those that needed them most. These days the organisation also directs its efforts towards preventing the causes of so many of the countries amputees. 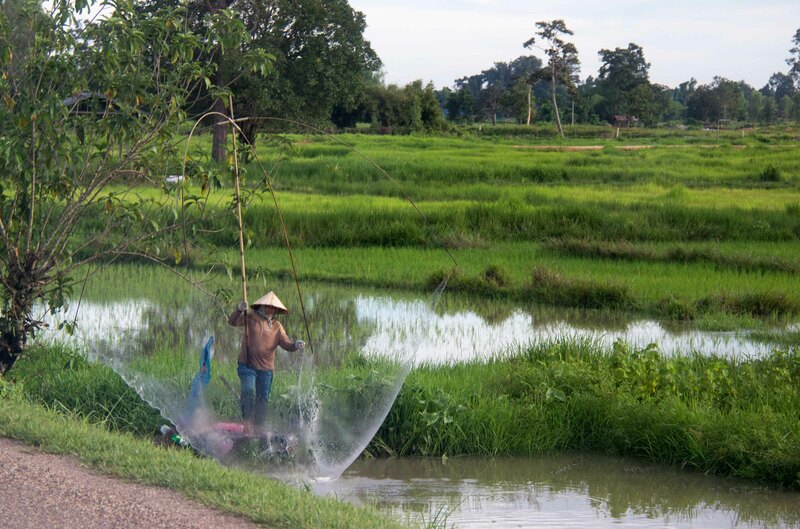 Laos, if you are not aware, was savagely mined and bombed by the U.S. during the Vietnam conflict – a plane load of munitions for every 8 minutes of the war kind provides some kind of scale to the devastation. The result of which was that the countryside has been peppered with unexploded devices, and since the Laotian economy is almost solely dependent on farming (until the borders opened to tourists some 15 years ago in any case), the population has been seriously blighted by them ever since. One interesting statistic listed at the centre is that there have been considerably more casualties due to mines and bombs since the war than occurred during it. COPE now heavily campaigns to support a UN sanctioned ban on the production and sale of scatter bombs. Their words can do this subject a whole lot more justice than ours can, so please take a look at their website http://www.copelaos.org/ for more details (and if any pennies have been weighing heavily in your pockets, they would be truly worthy recipients). That evening we met up with Jon, who was back in town, and another couple that he had met further north in Laos. A couple of drinks quickly turned into ‘let’s fit 5 people into a tuk-tuk and go find a nightclub’. Our search was successful, and we danced a few hours away with locals and tourists alike to some cheesy ‘top 40’ music. A good time had by all though, and we even managed to get a free ride back towards the hotel. Since we’d been stuck in the capital city we’d been staying in hotels / hostels, since they were super cheap, and the back of Ivor was just too hot / noisy to get a good night of slumber. We next had to be back in town on Tuesday to apply for 60 day Thai visas. It’s easy to get visas issued at the border, but these are only for 15 days, and we had time to kill between exiting Laos and our entry into Myanmar. So off we would go into the wilderness once more for a few days – we had heard about a lake / reservoir not too far away that would be on route for a circuit that toured some of the local villages. A game for the road that we devised back in China involved trying to spot any motorcycle with three or more people on before your opponent and keeping a tally, here are a couple of good ‘Fours’. (Animals, can constitute a percentage of a point, or a whole one depending on size, and haggling over the value is all part of the game). Our first attempt to get to the reservoir proved fruitless, the bold yellow line emblazoned across our GPS screen was yet to appear in reality on the terra firma. Construction had made it as far as the first layer of scalping so that we could still make steady progress, but they hadn’t quite gotten as far as the bridges. You may recall that this is rainy season, and the ford that would normally be in the dip in front of us would have, at any other time of the year, been quite manageable. Instead, we were presented with a good 50 meter crossing, and a small wooden raft. The raft looked unstable enough as the cargo of 2 mopeds was unloaded, so unless we wanted Ivor to meet a watery end, we would either be retracing our steps or waiting 2 months for the waters to recede. Option A then. We did eventually find dry route around, and made our way to the lakeside. We managed to stumble across a holiday complex, complete with casino and golf course, but made our way down a small road that followed the shoreline to find a more secluded place to camp. The area was popular for those taking a stroll away from the complex, so we had a few visitors coming over to say hi. One of which was the accounts manager at the resort we chatted to him for a while about the country, and the village that he had grown up in – and his concerns about the threat to his nation from their powerful northerly neighbour (China). He also outlined the places that we should visit over the next couple of days, and a route that should be free from watery surprises. Our new route would take us back past Vang Vieng, and then north east to the Plain for Jars area, or so we thought. Stopping in at Vang Vieng for lunch, we checked our emails and there it was – the plan breaker: An email from Hom, our contact in Myanmar, stating that India had closed the border crossing that we needed to use. With our exit point shut, and no other routes considered safe (the Bangladesh border area is rather volatile at the moment) it would no longer be possible for us to transit through Myanmar – the upshot of this was that we would have to drive down through Thailand and into Malaysia to pack Ivor into a shipping container, and fly over to India to meet up with him. Not great news, but part of the game – and the Myanmar trip always felt like a bit of a gamble. Our plans for the weekend also changed of course, we now had to go back to Vientiane and get our Indian visas changed, since they had identified our entry point as ‘Manipur’ only days before they closed it. Back to the Indian embassy, they are getting to know us quite well now. We would be able to collect our passports, complete with modified visas that afternoon (without paying the fee again, thankfully). 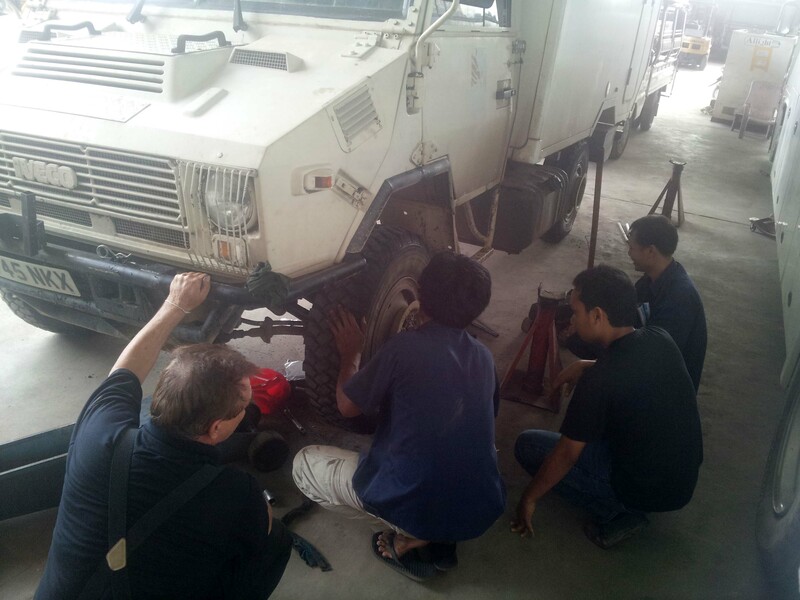 We treated Ivor to a gearbox oil change, and readied ourselves for a dash through Thailand while trying to establish shipping contacts in Kuala Lumpur. 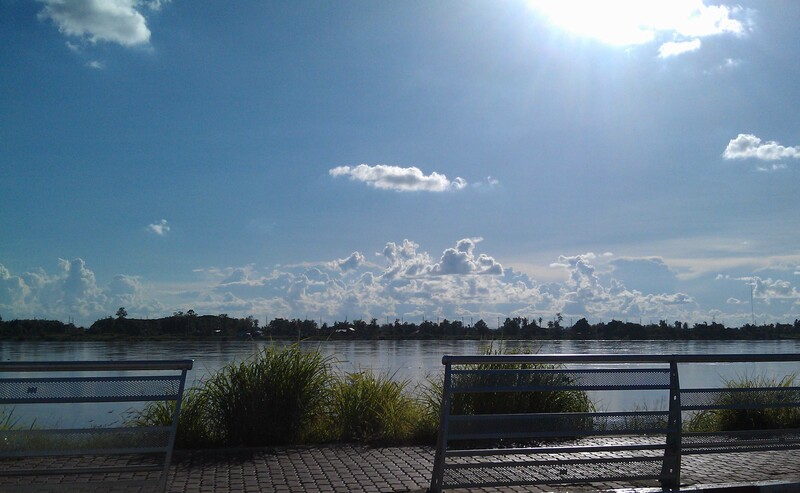 We went for a jog along the banks of the Mekong before the sun got too high – across the other side of the River was Thailand, where all being well we would be that very afternoon. Even with an early start we were still a sweaty mess before long at all. Otherwise our last morning in Laos would be largely spent trying to arrange our onward shipment from Malaysia. We took our time, and strolled around town, picked up another couple more Ivor treats (spares), and made it to the border mid afternoon. The paperwork was easy, and no one seemed to want to check it, so we paid our toll money and made our way onto the ‘friendship bridge’ over the border formed by the Mekong River. Having spent a large amount of our time here engaged in either visa applications or vehicle repairs, we had missed a lot of the things that we’d hoped to see – particularly now that we would be rushing straight to Malaysia to ship around Myanmar… However we should be back early next year on our way back north (if we can assemble another party for crossing China), and by that time the rainy season will be well behind us, so we will hopefully be able to make better use of our time then – we look forward to coming back!